81 Can anybody help me identify this bird. - It was seen and photographed in Kenya - Lake Navaisha. It appears to be Grey / Dark Grey head with white body then Grey/ Dark Grey tail. It appears to have stilted legs, almost like a heron and the beak is long and pointed ??? 160 Nearest I can think of is a Hamerkop. There's certainly a lot in common shapewise but the colours don't match. Could the apparent colours on this picture be a trick of the light? 81 HI - thanks for reply - The bird is definitely Grey / Dark Grey and White unless it is a different type of Hamerkop. 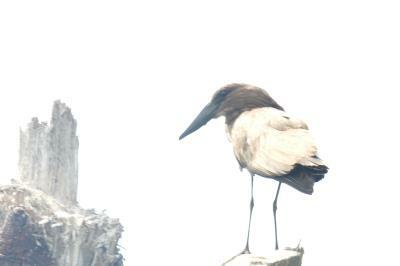 It is the only bird i can't identify after our Safari trip in Kenya ! 160 I searched for Hamercop pictures and only saw one where the feathers were quite pale in comaprison to normal. But that was still a solid colour covering the entire bird, unlike this one. With a beak like that you'd have though it quite easy to identify but I must confess to struggling with this one. I've put it out to a friend of mine who's far better at this than I am. Hopefully he'll come back with an answer. I'd love to do a safari trip sometime. 160 Heard back from my resident expert (RSPB representitive) this morning and he believes it to be a Hamerkop despite the colours. 81 Hi - Thanks for your help - It does appear to have similarities to the Hamerkop but when i did searches i could only find the brown Hamerkops, which i also have a photo from our Safari trip. I am unable to find a bird with those colourings. 160 Look up "leucistic hamerkop"
81 HI - Thanks for your help - I have found some pictures of leucistic hamerkops and it does seem this is the case... so that is my last Kenya bird identified - !! - Regards.